Adobe Experience Manager (AEM) is a comprehensive web content management system (WCMS). AEM provides a complete solution for building websites, intranets, online stores and ecommerce sites. It is highly scalable, yet very easy to use and allows website managers and authors to better engage with their customers online. As an Adobe partner, GPI developed a powerful CMS translation services connector in order to leverage best practices when localizing and managing multi-language websites and the translation workflows associated with them. GPI’s Translation Services Connector for Adobe Experience Manager enables users of AEM-based websites to initiate translation workflows with a single click and gain access to an array of reports to track and manage global translation projects through GPI’s Translation Portal. 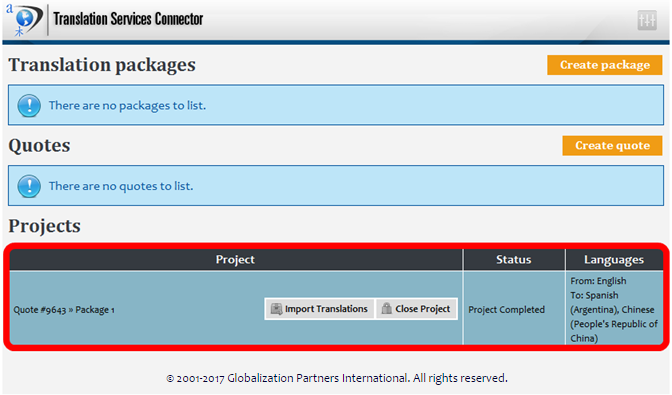 The connector allows AEM content authors/users to select the desired pieces of content to be exported for translation, manage their translation packages, manage quotes and import all the completed translations back into the CMS. Click on the “Create package” button. Select the target language(s) you want your content to be translated into. The next screen allows you to select from all the content in your system. You can click on the plus/minus (+/-) button to navigate the content hierarchy within the system to find the content you need. Once the items have been located, click on them to include them in the package. When you have finished selecting the content items, click the “Update Package” button to complete the operation. This will create a package with an “open” status. The “open” status means that at any time you can continue to add and remove documents to or from that quote. You can have several quotes open at the same time, each one with different documents and languages. 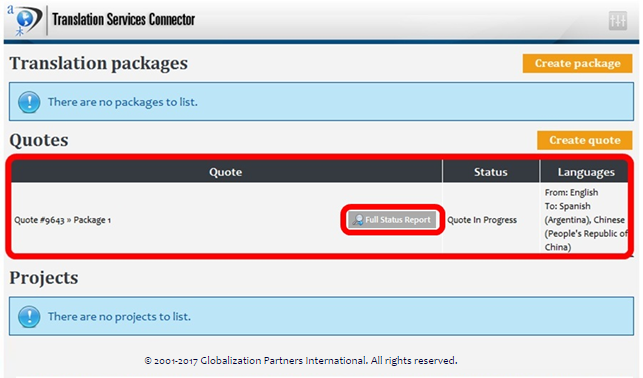 Request a quote: This action will change the status of the quote to “In Progress”. All the documents to be translated will be sent to GPI for analysis. A formal quote will be created by GPI and supplied back to you for approval. Modify Package: This action will open a new window, where you will be able to delete existing documents or add new documents to the quote. Delete: This action will delete the quote and discard any information stored in it. 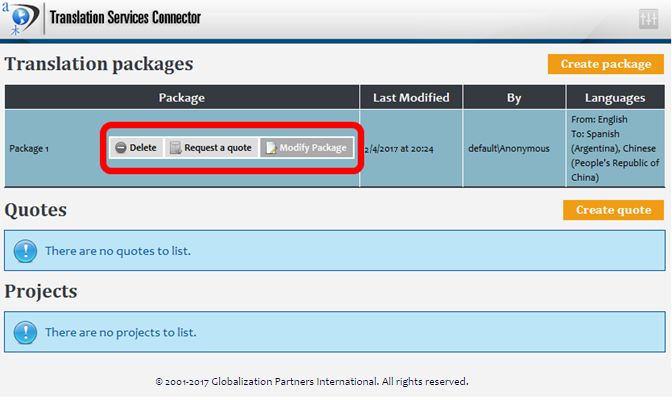 Once you click “Request a quote”, the package moves to the quote section, as seen below. However, if you needed to create an immediate quote, you can also choose the “Create quote” option. 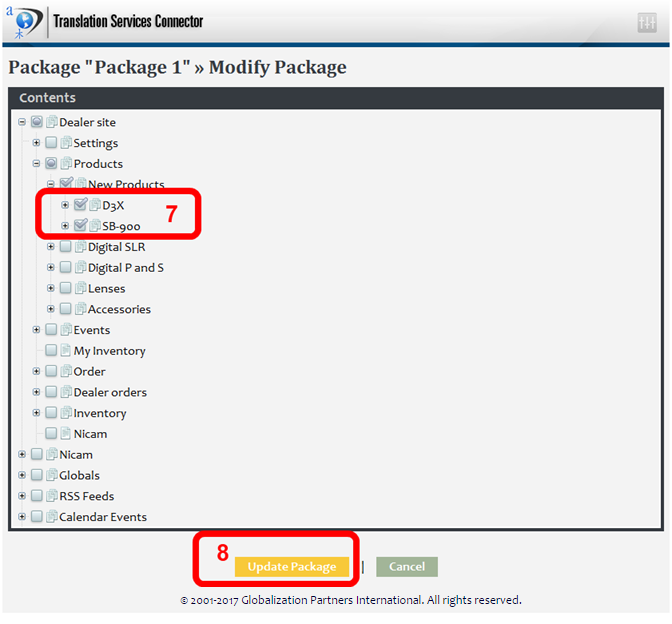 For this you would follow the same steps as creating a package and modifying a package. The only difference is when completed, all of the content is sent immediately to GPI and you won’t be able to modify it again. Full Status Report: This action will navigate to the Translation Services Portal. 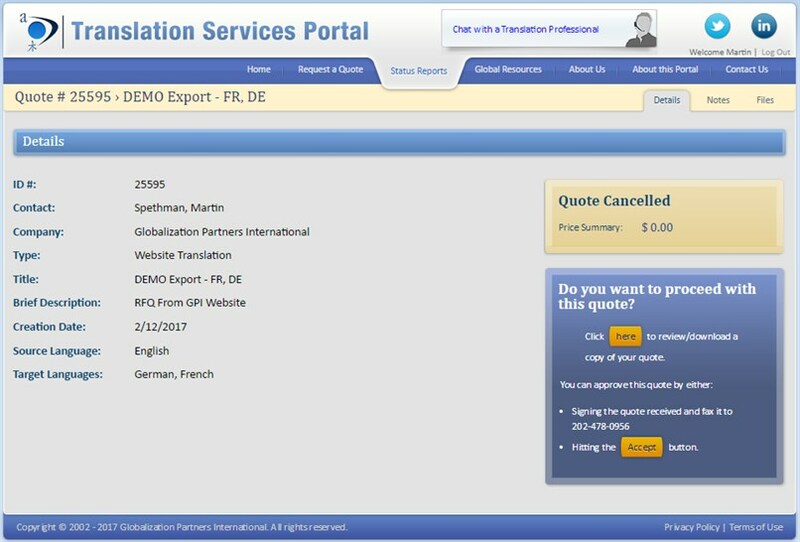 The Translation Services Portal provides the client with a wide range of reports and other uses full to track each quote. You will then receive the quote to approve. When approved, the quote moves to the project section with a status of “Project Started”. At this point GPI will commence the translation of your content. Import Translations: This action will import back all the translated content. Close Project: This action will close the project and remove it from the list.